Walking one of the largest cities of the world make you tired and in need for a cup of strong Turkish coffee. 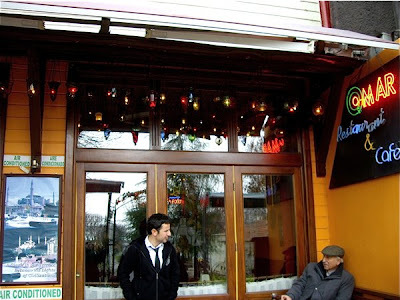 The first place we sat down was at Omar a stone's throw away from Hagia Sophia. A really nice place to rest. 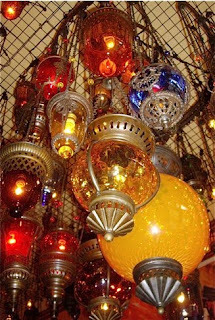 A striking feature are all the colourful lamps hanging all over the roof. We were so fascinated by this lamp-o-rama, that we ended looking up all the time, finding another ornate shaped lantern to rest our eyes on every time we looked up. Coffee is not the only thing you can get at Omar. You may, in fact both lunch and dine there, with a great view of the two mosques. We, however, decided to take a sip to a small, hot cup of coffee. As the staff heard that we were Norwegian, they showed us a clipping from a Norwegian newspaper featuring the writer Thorvald Steen as one of the regulars at Omar. He has, in fact written stories from the city, and he calls it the most important city in the world. It is difficult to prove that statement, but I certainly agree with him that Istanbul has not been recognized as an major historic and cultural centre in the same way as e.g. Rome. It has been a destination for pilgrims, tourists and crusaders for two thousand years and a bridge connecting the Muslim to the Christian culture. You can certainly feel that importance at Omar. From here you can see Hagia Sophia, a church built in the 4th century, and you are only a short walk away from other sights as the Hippodrome and the Cisterns.